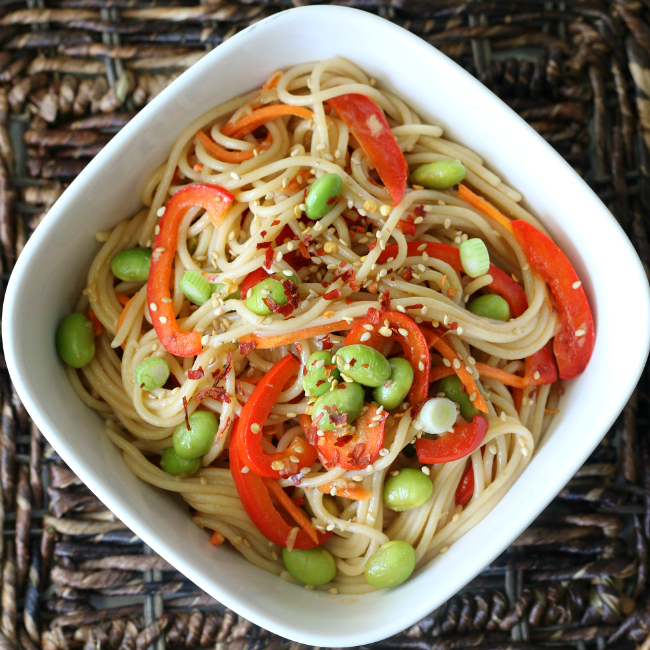 I’m crazy about this new recipe for gluten-free sesame noodles with vegetables. While I found great organic produce to use in it, I can’t wait until our summer garden supplies me with the fresh veggies I need for making it too! This light and healthy spring recipe is sponsored by iHerb. 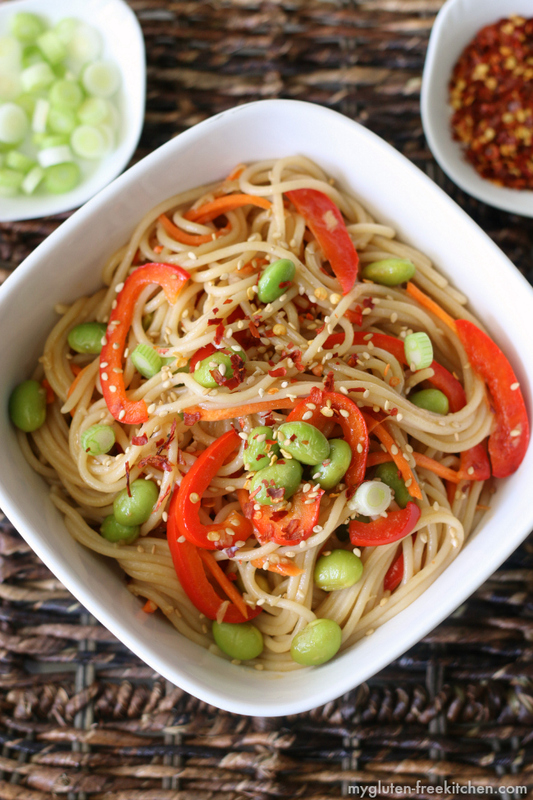 While I made this gluten-free sesame noodles recipe to be an easy meatless meal, I’m actually most excited about this as a make ahead lunch idea! I struggle with eating healthy lunches, sometimes even with eating lunch at all. I’m prone to just snacking throughout the day. But as I enjoyed this for lunch today, I thought it was the perfect dish that I could make on Sunday or Monday, package up, and enjoy for lunch the next 3 days! While that’s my plan, I’m pretty sure I’m going to be fighting off my family for who gets the lunch containers of this! I might have to make a double batch every Sunday for the week ahead. It’s healthy and just filling enough without feeling heavy. The edamame provides a good source of protein, so it’s easy for this to be a meatless meal. However, if you’d like, you could surely add some meat or tofu to this as well. This was a different sort of recipe for me to develop. I actually started with the ingredients first, then came up with the recipe! I was browsing the gluten-free section on iherb.com to see all of their options (there are many) and a few ingredients in particular caught my eye. To be honest, my favorite allergy friendly chocolate caught my eye first, because – chocolate! But after I reminded myself that I just did a month full of chocolate recipes and was hoping to add more gluten-free lunch and dinner recipes, then I spotted a few ingredients I just had to have. I noticed these organic toasted sesame seeds and organic sesame oil and that iherb.com carries my go to brand of gluten-free spaghetti noodles. I thought making some sort of sesame noodles would be fun! I figured adding some coconut aminos (similar to soy sauce) would add some great flavor. I decided to do a spin on my gluten-free chicken lo mein recipe, with a little different flavor profile and also making it a meatless meal. I did some googling and found out that sesame noodles are actually a popular take-out meal – I had no idea! Since I’d already sketched out what I was going to create, I looked for further inspiration from the popular take out meal. I noticed it included chili oil or chili paste, and some included peanut butter. Since I already have a gluten-free peanut butter noodle recipe, I didn’t want to go that direction, but the idea of adding some chili paste was a good one! I added the chili paste to my iherb.com cart along with the other items and waited patiently for them to arrive a few days later. Sesame oil – I used this organic sesame oil. I loved the flavor of it! Some recipes have you dilute the sesame oil with vegetable or canola oil, but I really liked using all sesame oil for mine. Coconut aminos – I’d first tried Coconut Secret coconut aminos last fall at the food allergy bloggers conference and was impressed at how much it tastes like soy sauce. Gluten-free tamari sauce would work well as a substitute. Rice Vinegar – Rice vinegar is gluten-free! Actually all vinegars other than malt vinegar are. Feel free to swap with apple cider vinegar if that’s what you have on hand. Chili paste – Just a little chili paste adds a lot of flavor and heat! We liked it with just 1/2 teaspoon in my recipe, but you might like to go up to 1 teaspoon if you really love the flavor and heat. Gluten-free noodles. 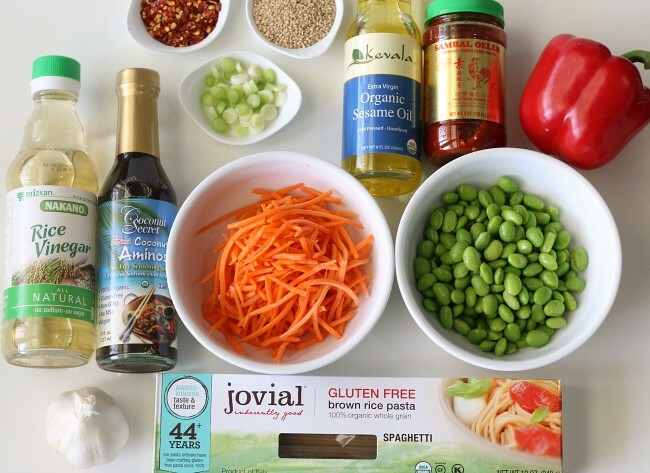 I chose Jovial gluten-free rice spaghetti. It’s one of my favorite brands of gluten-free pasta. It worked perfectly in this dish. Sesame seeds – I liked these organic toasted sesame seeds way better than any I’ve tried before! I sprinkled these on before serving, but you could also stir in more of them when you add the pasta. Red Pepper Flakes – Red Pepper flakes were perfect for shaking on as a topping to add a bit more crunch and flavor. Edamame – The first time I made this I used frozen edamame in the shell. After I microwaved them a few minutes, I had to remove them all from the shells. The second time I made this, I learned my lesson and bought frozen edamame that is already removed from the shell! Much easier! If yours is frozen, microwave just until it isn’t frozen anymore before using in recipe. I’ll definitely shop from iHerb.com again. I was able to find some ingredients there that are a little harder to find in my town. Those of you that live in rural areas will love that part too I know! They sell over 35,000 products and ship to over 160 countries! They’re also a Google Trusted Store and their customer service team provides support in 10 different languages. Gluten-free products were very easy to find on the website. If you’re ready to order from them, new customers can click here to get $5 off their first order! I chose to use all organic vegetables to go along with the organic bottled/jarred ingredients for these gluten-free sesame noodles. If you've got garden fresh veggies, go ahead and add them! Start 3 quarts of water boiling. While water boils, prepare all of your vegetables - mince the garlic, slice the red pepper and green onions, remove the edamame from shells, shred the carrots if you didn't buy pre-shredded ones. Set aside all veggies until ready to use. Add gluten-free spaghetti noodles to boiling water and set timer for 11 minutes like package suggests. In a large skillet or Dutch Oven, add sesame oil and minced garlic. Cook over medium low heat until garlic is fragrant and just barely begins to brown. Add coconut aminos, rice vinegar, and chili paste and stir together with skillet safe spoon. 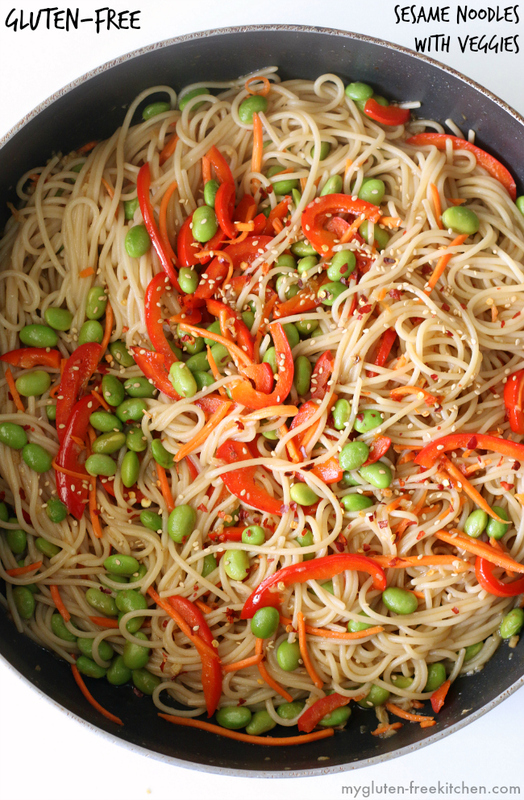 Add edamame, shredded carrots, and sliced red peppers to the skillet and stir together. Cook over medium heat for 3 minutes to meld flavors and warm the veggies. Turn off heat. Drain the gluten-free spaghetti noodles then add to skillet. Stir together until noodles are coated with sauce and veggies mixed throughout. Sprinkle with toasted sesame seeds, red pepper flakes and green onions if desired. Serve with more sesame seeds, red pepper flakes, and green onions on the side for everyone to add to taste. We enjoyed this dish warm as well as eating the cold leftovers in a lunchbox. This sponsored post was created through my partnership with iHerb. As always, all opinions are my own. Collaborating with brands I love allows me to keep bringing you new and varied recipes! Thanks for your support! I’ve never heard of iherb, but I’ll definitely have to check it out. I hate having to shop multiple stores to find a few different ingredients. Also, this looks so light and fresh, I think I’ll try making it ahead for lunch as I have the same problem…I’m a snacker. Thanks for the recipe! Any Asian inspired meal is a favorite of mine! What a beautiful looking meal! This looks amazing! I love the color pops!